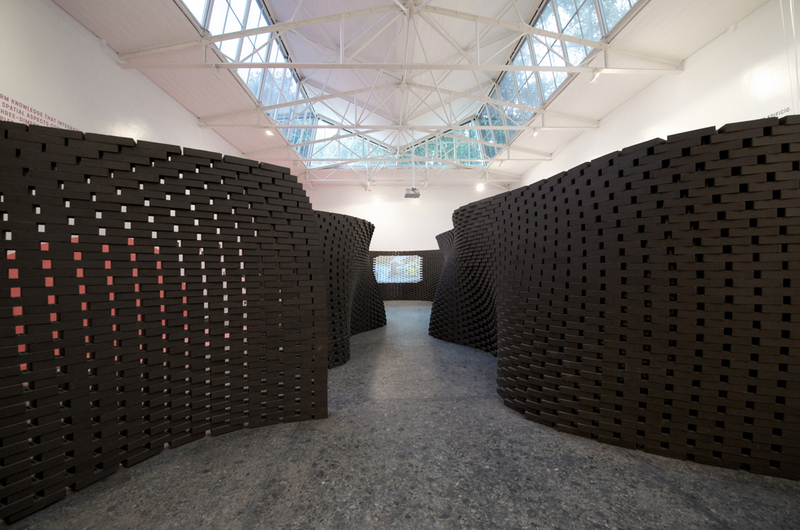 The design of the wall followed algorithmic rules and was built on site at the Giardini, the grounds of the Biennale, by the ROB mobile robotic fabrication unit. 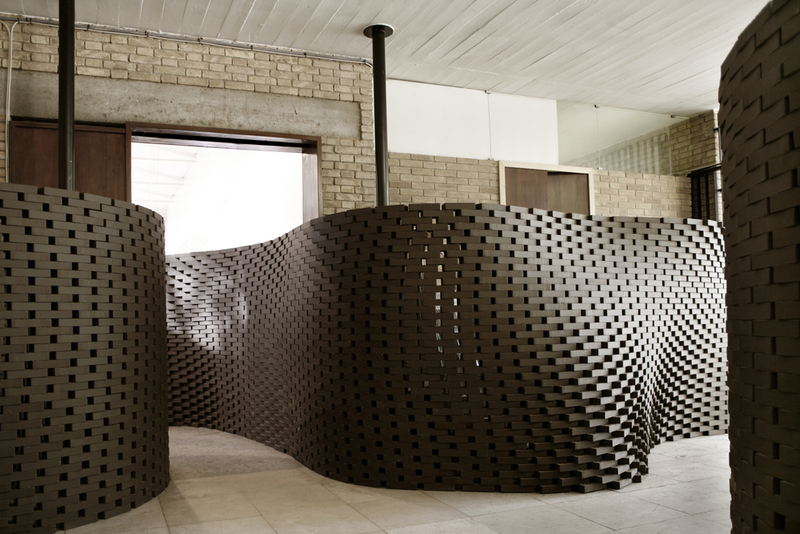 With its looped form, the wall defines an involuted central space and an interstitial space beyond, between the brick wall and the existing structure of the pavilion. Passing from one space to the other, the visitor gains access to the exhibition. 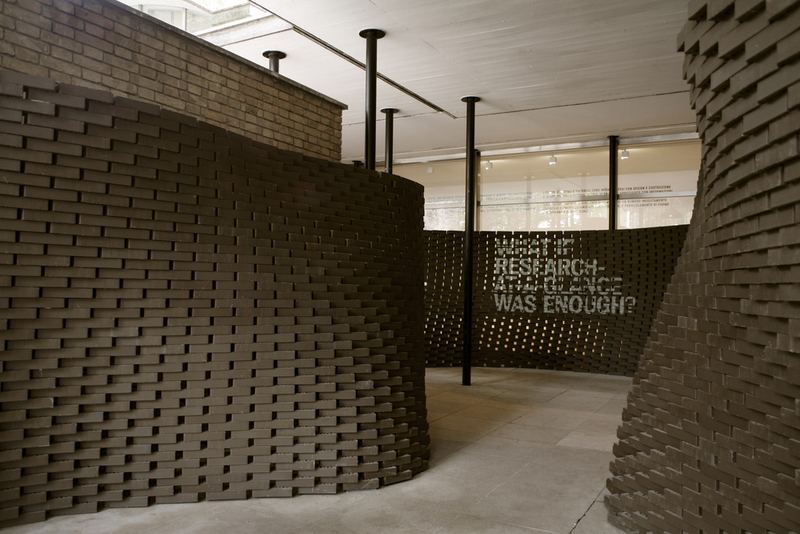 Through its materiality and spatial configuration the wall, consisting of 14,961 individually rotated bricks, enters into a direct dialogue with the modernist brick structure from 1951 by Swiss architect Bruno Giacometti. The wall’s design was conceived as a system with open parameters. The course of a single, continuous curve carried all the generative information necessary to determine the design. This curve functioned as a conceptual interface, which enabled the needs of the individual exhibited groups to be negotiated. 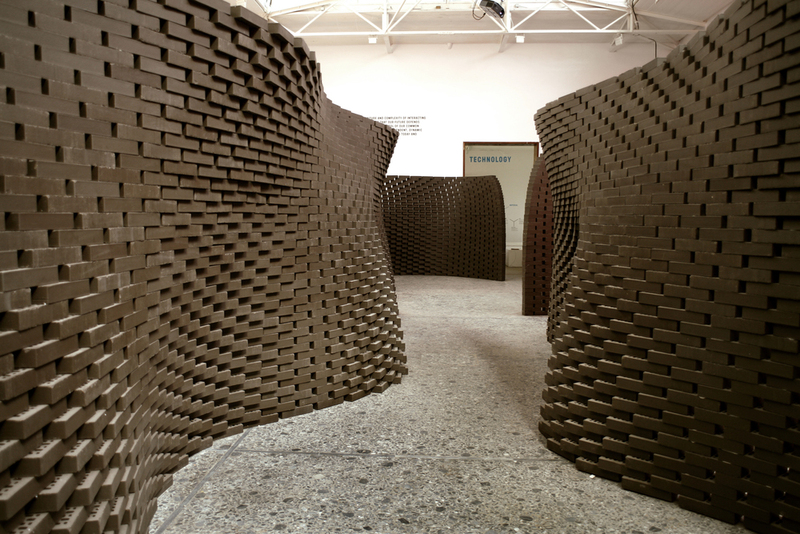 As each group’s requirements were modified, the three-dimensional, undulating wall could be automatically re-generated. Its complex shape was determined by the constructive requirement that each single, four meter long segment should stand firmly on its own. Where the course of the generative curve was almost straight, meaning that the wall elements could possibly be tipped over by the visitors, the wall’s footprint began to swing, thus increasing its stability. Each curvature in the lower layers was balanced by a counter-curvature in the upper layers, thus giving the wall its architectural expression. 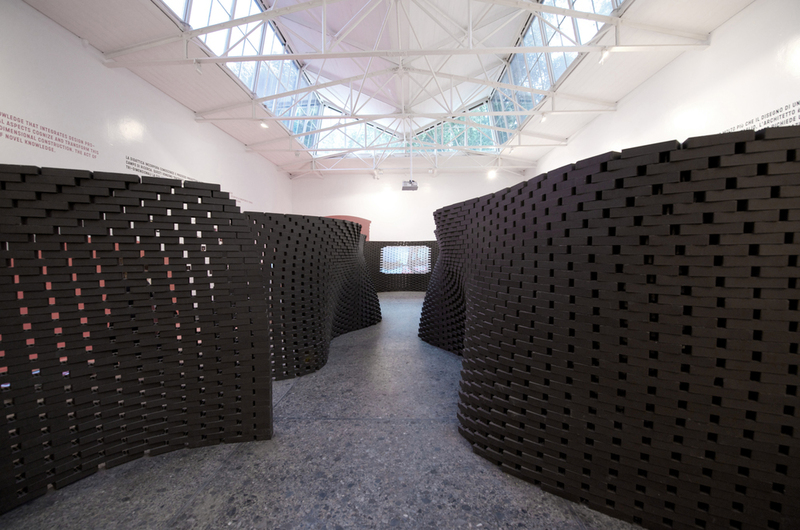 The wall loop adapted its shape according to its course, widening and narrowing, producing tension-rich spaces to lead visitors through the exhibition. In addition, the individual bricks were rotated according to the curvature—the greater the concavity of the curve, the more the bricks were rotated. This further emphasised the plastic malleability of the wall, which acquired an almost textile character, in oscillating contrast to the firm materiality of the bricks.